Harsh thermal environment: Although drug delivery devices are a popular way to administer drugs, they expose these drugs to a very harsh environment. The drugs can be subjected to both thermal cycling, and other uncontrolled temperature extremes. The thermal cycling issues are particularly bad for prefilled pen delivery devices (injection pens). Prefilled pens can contain a up to month's worth of medication, and are often used by unskilled patients in a home environment. The same pen may be cycled in and out of a refrigerator every day for a month. What if the patient leaves the pen out for too long, or accidentally puts it in the freezer? What if the patient wants to travel, and isn't meticulous about temperature control? Some of these drugs are temperature sensitive: Drug delivery devices are used for therapeutic proteins, emergency medical drugs 1, 2, 3, 4, 5, continuous ambulatory infusion antibiotics 1, 2, 3, 4, chemotherapy 1, 2, and other small-molecule drugs. A number of these drugs, in particular β-lactam antibiotics such as the carbapenems, are more temperature sensitive than standard pharmaceuticals. The result, deteriorated drugs, and sometimes even anti-drug antibodies: In certain cases, patients receiving therapeutic proteins by subcutaneous injection from drug delivery devices can have an elevated risk of developing antibodies against the biotherapeutic 1, 2, 3, 4, 5, 6, 7. In other cases, the drug may have lower therapeutic effectiveness. The solution: build stability monitoring into the drug delivery device. Fortunately there is a way to address these issues -- incorporate LifeTrack stability monitoring technology into the drug delivery device. The LIfeTrack technology can continually monitor the storage history of the drug, and can warn patients if the drug is unfit due to an improper thermal storage history. LifeTrack stability technology, incorporated into a prefilled pen delivery device for a biotherapeutic or temperature sensitive drug. Here the "+" on the pen's embedded LifeTrack LCD display lets the user know that the drug is still OK to use. 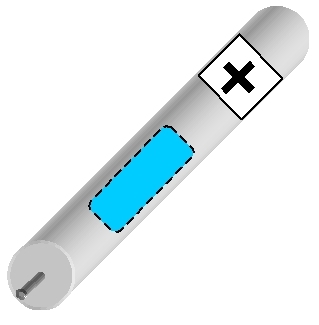 A generic pen can be made, and programmed to fit multiple types of drugs. LifeTrack stability technology, incorporated into a continuous ambulatory infusion device such as an insulin pump. 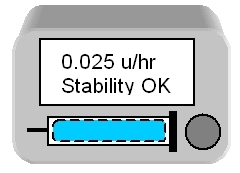 Here the output from the LifeTrack stability monitor is displayed along with the other pump parameters, and can even be used to automatically shut the pump down in the event of stability failure. For more information, see our articles in Drug Delivery Reports and Drug Delivery Technology.